With an ideal location, award-winning meeting venues and elegant accommodations, Indianapolis Marriott Downtown is the perfect home base for your next business or leisure trip. Our hotel boasts extensive event venues with over 38,000 square feet to bring meetings and celebrations to life. For conferences off site, take our skywalk to Indiana Convention Center. Circle City Mall, White River State Park and Lucas Oil Stadium are also just walking distance from our hotel, allowing you to explore some of the city's best attractions effortlessly. After a busy day in Indianapolis, break a sweat in our fitness center appointed with cardiovascular equipment and free weights. Our hotel rooms and suites are a representation of modern luxury with rich furnishings, unique decor and expansive windows. Stay productive with our ergonomic workspaces and high-speed Wi-Fi, or sink into relaxation with our plush bedding. 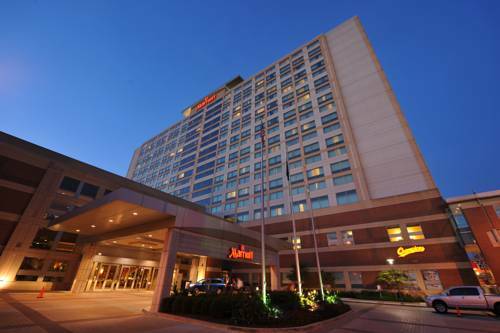 Experience a successful stay at Indianapolis Marriott Downtown. Catch all of the game-day action at Champions, our friendly sports bar boasting 28 HDTVs and 2 HDTV jumbo screens. With casual food and refreshing cocktails, it's the ideal place to unwind after a long day in Indianapolis. Indulge in innovative dining options and creative cocktails at Circle City Bar & Grille. Our elegant restaurant offers an upscale atmosphere complete with oversized booths, warm wood tones and vibrant artwork. Start your day with your favorite coffee freshly brewed. Ask for your latte, tea or cappuccino in our on-site Starbucks stand, located in our lobby. This big fiberglass bovine stands watch at the water tower of an Indianapolis suburb. A furniture store went big with a towering chest of drawers and an equally scaled giant rocking chair. Store and drawers burnt in 2001, but the chair rocks on. A 2.5-ton steer named Old Ben, dead over a century, but preserved behind glass. 40-foot-tall columns of limestone, tightly grouped into a visually memorable memorial to the county's war dead.